The 249-pound (113-kilogram) spacecraft carries a telescope and a camera to locate and help track objects in geosynchronous orbit, a belt thousands of miles over the equator home to commercial and military communications, surveillance and weather satellites. Developed by the military’s Operationally Responsive Space office, the spacecraft fills a looming data gap expected once the Air Force’s current Space Based Space Surveillance Block 10 satellite ends its mission, and before a follow-on program is ready for liftoff. 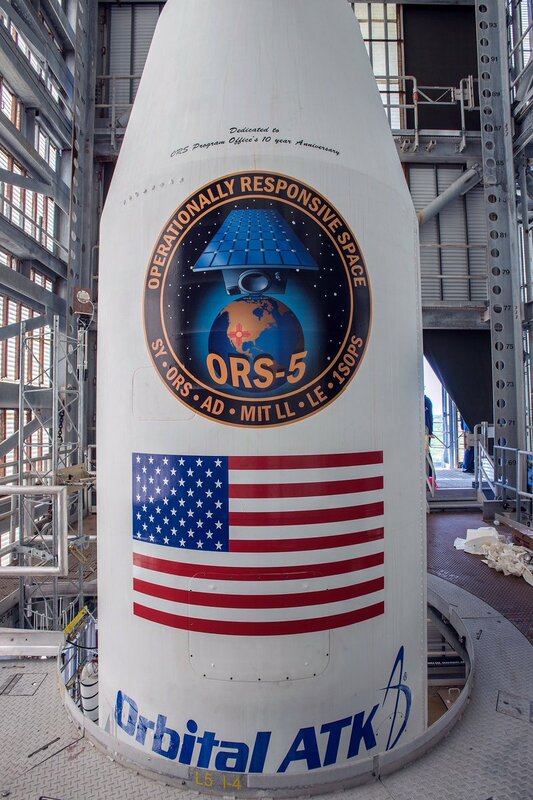 Named ORS-5, or SensorSat, the spacecraft will ride a Minotaur 4 rocket into orbit from Complex 46, a long-dormant launch pad located near the eastern tip of Cape Canaveral. A four-hour launch window opens at 11:15 p.m. EDT Friday (0315 GMT Saturday). Forecasters from the Air Force’s 45th Weather Squadron predict a 60 percent chance conditions will be acceptable for liftoff Friday night. Their primary worry is with cumulus and thick clouds over the launch site influenced by a nearby tropical wave. The five-stage booster is comprised of three modified solid-fueled rocket motors from the Air Force’s decommissioned Peacekeeper missile stockpile, and two commercially-produced stages to inject the ORS-5 satellite into orbit. Friday night’s launch will be the first Minotaur flight from Cape Canaveral. Fifteen previous Minotaur missions, all using retired Minuteman or Peacekeeper missile parts, have launched satellites into orbit from pads in California, Virginia and Alaska. The $87.5 million ORS-5 mission is the latest in a line of relatively low-cost military projects managed by the ORS office. Previous ORS missions have tested plug-and-play satellite technology, deployed experimental imaging and data relay satellites, and demonstrated an autonomous rocket destruct mechanism now used on commercial launchers. 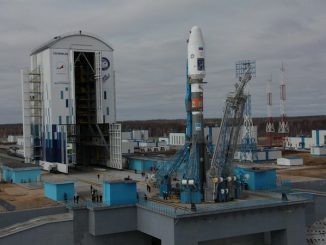 SBSS Block 10 will exceed its seven-year design life later this year, and a full-up replacement satellite is not expected to launch until at least 2021. The military needed a dedicated rocket for the ORS-5 mission because of its unique orbit 372 miles (600 kilometers) directly over the equator. 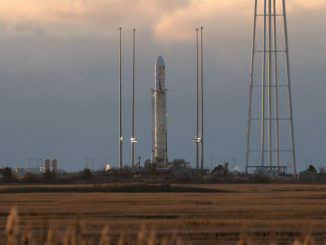 That type of orbit required the Air Force and Orbital ATK to base the launch from Cape Canaveral instead of from an already-used Minotaur pad at Wallops Island, Virginia. The Minotaur 4 usually comes with four stages, but the ORS-5 satellite’s equator-hugging orbit needed an extra boost. Instead of flying with a single Orion 38 rocket motor on top of the Peacekeeper missile stack, Friday night’s launch will carry two Orion 38 stages. The Minotaur 4, which stands about eight stories tall, will take off from pad 46, a complex which last hosted a launch in 1999. Space Florida, an arm of the state government, paid $6.6 million to refurbish the launch pad for the ORS-5 mission and future launch opportunities, according to Jim Kuzma, Space Florida’s chief operating officer. Heading east from Florida’s Space Coast, the Minotaur 4 will race into the sky on top of a half-million pounds of thrust before dropping its Peacekeeper first stage into the Atlantic Ocean about a minute after liftoff. Two more Peacekeeper motors will fire back-to-back until T+plus 3 minutes, 17 seconds. The Minotaur’s nose cone will jettison during the third stage burn once the rocket flies into space. The three Peacekeeper rocket stages were originally manufactured and packed with solid fuel in the 1980s. The motors launching Friday are 28, 29 and 30 years old, according to Lt. Col. Chad Melone, division chief of the Space and Missile Systems Center’s launch enterprise services directorate. The motors were stored at Hill Air Force Base in Utah until they were pulled from the military’s stockpile. 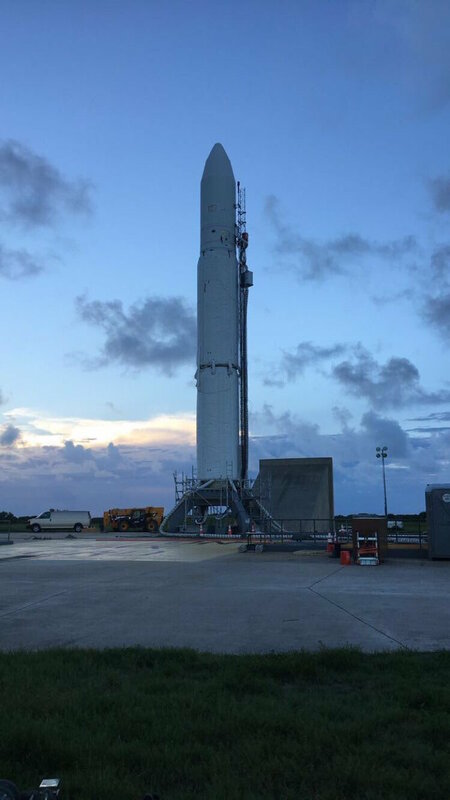 Technicians repainted the rocket stages and handed them over to Orbital ATK, which installed avionics and other equipment to make them ready for a satellite launch. The Minotaur’s Orion 38 fourth stage will ignite around 14 minutes into the flight, burning for approximately one minute to reach an elliptical, oval-shaped orbit ranging in altitude between 248 miles and 372 miles (400-600 kilometers). The temporary parking orbit will have a tilt of 24.5 degrees to the equator. Three CubeSats will release from the Minotaur rocket beginning about 17 minutes after launch. 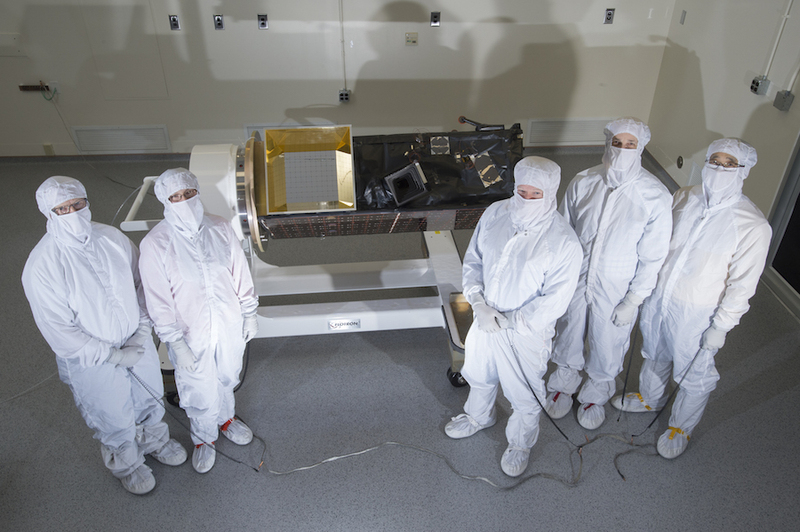 The secondary payloads include two 1.5-unit CubeSats, weighing around 3.3 pounds (1.5 kilograms) each, from Los Alamos National Laboratory. 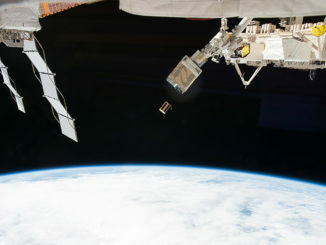 A larger shoebox-sized CubeSat from the Defense Advanced Research Projects Agency, or DARPA, with a weight around 6.6 pounds (3 kilograms) is also hitching a ride. Soon after the CubeSat deployments, the fourth and fifth stages of the Minotaur 4 will detach. The final Orion 38 stage will fire for a little more than a minute to circularize ORS-5’s orbit at 372 miles and steer it onto a course that stays over the equator. Separation of the ORS-5 satellite from the Minotaur 4 rocket is expected at T+plus 28 minutes, 28 seconds.